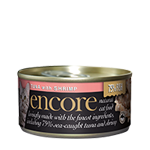 Is there any taurine in Encore wet food? Encore pouches, pots and tins are rich in Taurine because it occurs naturally at high levels in muscle tissue which is the meat – chicken breasts, tuna, sardine and mackerel fillet – that we use in these recipes. Taurine is an amino acid essential for the proper function of the heart and for eye health. In many other brands the level of natural taurine can be very low which is why they need to add synthetic taurine to their food to meet the minimum standard required by a cat. 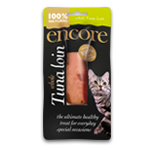 Independent scientific test have shown that Encore Fish in broth varieties more than exceed the daily requirement of Taurine for cats and provide it in a natural form. Cats require a high level of taurine for their body functions, yet have limited enzymes which can produce taurine from other amino acids such as methionine and cysteine. Therefore, they need a diet that is high in taurine. If taurine is deficient, signs such as heart condition called dilated cardiomyopathy, retinal degeneration, reproductive failure, and abnormal kitten development can occur. I have been told that I shouldn’t feed complementary pet foods? 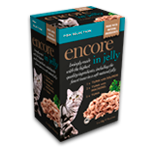 Encore complementary pet foods for cats and dogs are perfectly safe to feed as part of a balanced diet. As in humans, cats and dogs have a recommended daily intake of vitamins, minerals, fats and proteins. Many brands add a vitamin pack to their food in order to meet the regulations for a complete food. 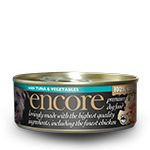 However vitamin packs can affect the palatability of wet foods and so, at Encore, we prefer cats and dogs to receive 100% of the natural meat goodness of the high quality ingredients we use in our tins, pots and pouches. We also offer complete wet and dry foods for cats and dogs. 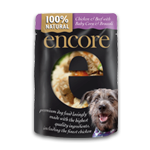 Encore dry foods are GRAIN FREE and contain up to 80% chicken as well as an active probiotic or prebiotic. Adult and kitten or puppy formulations are available. Encore pate is made with fresh natural ingredients including chicken, salmon or rabbit. 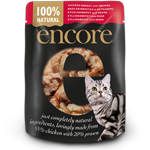 Encore complementary foods – can be fed with Encore complete cat or dog foods for a balanced diet. Please remember to check the feeding guide and adjust the level of dry food if you are feeding with wet food to avoid your pet gaining weight. Why are the ingredients in Encore pate all very similar? 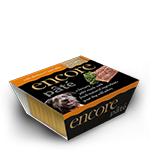 As a pate, Encore uses fresh human grade offal including liver and kidney as a base to which other ingredients are added to make the different recipes for example rabbit or salmon and vegetables (Encore dog pate). We created a pate style recipe following consumer research as this was the best way to add a complete food to our wet range without compromising palatability or our commitment to use the best possible human grade ingredients in our wet foods. Why is your wet food made in Thailand? We create Encore pet food with a number of specialist partners in UK, France Austria, Spain and Thailand. Our partner in Thailand is one of the largest suppliers of canned tuna and prepared chicken in the world. It is a human food factory which has been awarded grade A by the British Retail Food Consortium in Food Safety. This is acknowledged around the World as the gold standard in producing human food, and we are one of the very few companies which has this standard for our pet food. Each Encore recipe is created to a strict quality specification and all of the ingredients can be traced from source through the manufacturing process. The chickens come from carefully selected farms which have been chosen for their high welfare standards. These are barn chickens which are allowed to grow for twice as long as standard UK Chicken and they have four times as much room to roam. All of the tuna used in encore recipes is from sustainable tuna species caught using Dolphin Friendly fishing methods and our tuna is endorsed by the Earth Island Institute in the USA. We create our foods with suppliers across Europe – UK, France and Austria, in USA, Australia as well as Thailand this is because we want to work with the very best manufacturing expertise and production standards across all our kitchens. Encore is a natural pet food that exceeds the criteria for product inclusion and packaging declarations as outlined in the guidelines of both FEDIAF, AAFCO and PFIAA regulatory authorities for Europe, USA and Australia. Why do you use 75 to 80% chicken in Encore Complete Dry Dog and Cat Food, does it really matter where the protein comes from? Humans can metabolise protein from cereals but cats and dogs find it easier to digest it in their food if it comes from animal protein rather than from grains or cereals. Cats and dogs are carnivores by nature and need a diet that contains animal protein to thrive and stay healthy. In fact, as obligate carnivores, cats will not survive very long without it. Not all protein is the same. Proteins are very complex in structure and proteins are required for all aspects of growth and development and are very important in structural makeup and the immune system. Proteins are made up of amino acids, which are the building blocks of health and development. Cats for example require 22 amino acids only 11 of which they can synthesize themselves. The remaining ones – which are called the essential amino acids they must get from their food otherwise health problems can occur. 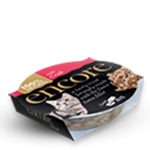 Encore complete dry foods have been developed to ensure that your cats’ (and dog’s) diet is naturally rich in all the essential amino acids to keep your pet healthy for longer. The protein level in Encore Complete Dry Food, is higher than my current food, and I have always believed that a high protein diet can cause kidney problems. No, this is a myth and probably started because in the past, patients with kidney problems were commonly prescribed a low protein and therefore a low – nitrogen diets. It is the nitrogen that causes the problem not the protein level. Today, pets that have kidney problems are more likely to be put on a diet that is high in digestible protein, such as Encore, rather than a product based on cereal protein, which is poor in digestible protein. As Encore Dry is high in Protein will it make my pet fat? No in the fact the opposite is true. After a month or two most cats or dogs will show an increase in lean muscle mass and as Encore in low in carbohydrates most overweight cats will actually lose weight. It is not possible to have a zero carbohydrate diet because even high protein materials have carbohydrate fractions – e.g. glycoproteins. For example muscle contains glycogen a glucose polymer similar to starch. Cats and dogs, like all mammals, make some carbohydrate from protein (gluconeogenesis) so that they have glucose and other sugars for important functions such as energy for the brain. So although they may not have a dietary requirement for carbohydrate as such, they do need carbohydrate in their metabolism. Carbohydrate in the form of fibre is also important for gut health – both for prebiotic functions e.g. oligosaccharides and “bulk volume” to allow gut contents to move and avoid constipation. Is there salt in your diet as I have been informed over the Internet that salt is bad for a cat’s health. Yes, there is most definitely salt in our dry food formulation. There is 1.134%, which is the ideal level for cats. Too much salt we all know is bad for us as it can lead to high blood pressure but a zero salt diet is also very bad for us. Cats like ourselves need an optimum level to keep us healthy. Sodium is one of the key elements in salt and is one of the primary electrolytes in the body (the other two are potassium and calcium). Too little salt in the diet can lead to muscle cramps, dizziness, or even an electrolyte disturbance, which can cause severe, even fatal, neurological problems. Drinking too much water with insufficient salt intake puts a cat at risk. Salt can also contain many beneficial minerals including magnesium, iodine, and over 21 essential and 30 accessory minerals beneficial to a cat health. I understand that most of the chickens used in American dry pet food use battery hens, which I think is cruel. Do you use any battery hens in your product? Absolutely Not. We refuse to use any battery farmed chicken or eggs in our food. Why do you use Vegetables such as Potato? Low amounts of carbohydrates are natural for a cat and dog. We use potatoes that are rarely associated with dietary sensitivity. Potato delivers a good source of nutrition and is generally well accepted, ensuring good palatability throughout our complete food range. They also help to balance the Amino Acids in the meat protein. Do you use any GM ingredients in Encore Complete Dry Food? It is not illegal to use GM ingredients in Pet Food and many American brands have used GM ingredients in their Pet Food formulas for many years without any known side effects. However, at Encore we have taken the decision NOT to use any GM ingredients in our complete dry range. Do you use BHA, BHT or Ethoxyquin in Encore Complete Pet Food? My pet suffers from a wheat and cereal allergy. When can I expect to see an improvement to my pet’s wellbeing by feeding Encore complete? Within 6 – 12 weeks you should see an improvement and find that your pet will stop scratching and biting himself. If your cat or dog has lost fur and has developed a bald spot as a result of an allergy it can take six months for the fur to grow back although in some cases it may not grow back at all. Always consult with your vet. I have noticed that on the label of all pet foods it states that ash is in the product, why? The term “Ash” is a rather confusing pet food industry term, that a pet food company has to use by law to measure the total mineral content in the food. It represents important minerals such as calcium, sodium, potassium, phosphorus, zinc, iron, copper, manganese etc. Is there anything wrong in feeding tinned meat with Encore Complete? 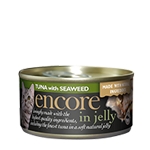 If your pet suffers from a wheat allergy or beef allergy you should be very cautious in feeding any other tinned food other than Encore Canned. Encore Canned range has been developed to ideally compliment the Encore Dry Range. What digestive ailment or skin complaints can be alleviated on Encore Complete? In our experience customers have reported improvements in conditions such as eczema, dermatitis, red meat allergy, and colitis. If you have any concerns regarding your cats diet then please consult your vet. 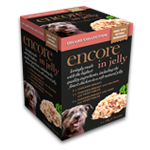 Encore Complete is highly digestible and is concentrated goodness for your pet. As a result your pet’s nutritional needs will be met with less food, since your pet will utilise more of the food taken in as nourishment. Your pet will produce smaller firmer darker stools with less offensive odour, making clean up faster and easier. I am worried about Urinary Tract problems. My vet has informed me that this can be prevented by the use of an appropriate diet. Is Encore complete suitable? Problems can occur in a pet with the formation of stones in the urinary tract. One cause is the high level of magnesium in a pet’s diet. Encore Complete has been formulated to contain restricted levels of magnesium. Sufficient magnesium is present to meet the body’s requirement yet will aid in the prevention of urinary tract problems. However, there are many forms and causes of urinary tract disorders and if you have any concerns please consult your vet. Different types of cereal gluten can cause a problem in some pets. The allergy can result in excessive scratching, hair loss and excessive body odour. 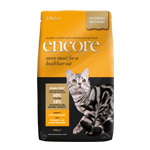 Encore complete is particularly suitable for cats that suffer from to gluten intolerance. However, if you have any concerns, please consult your vet. Why does the colour of the kibbles change during the year? Encore dry is only made in small batch runs from fresh natural local ingredients. As the seasons change so does the colour of our ingredients and you will find that the colour will change from a dark brown to a slightly lighter brown but the recipe is still exactly the same. I read that pet foods can be treated with radiation. Is this true and does Encore use this method? The US Food and Drug Administration have approved irradiation as an (‘allegedly’) safe and effective means of processing dog and cat food products and treats. It is also used to make ‘safe’ contaminated packaging. There is no legal duty to inform the public if any packaging has been treated in this way. At Encore we refuse to use such methods. I make my own home made pet food why would Encore be better? I read on the Internet that anti freeze is added to pet food. Is this true and does Encore have anything like this or any artificial ingredients in their food? Propylene glycol is used by some manufactures to preserve their pet food and this chemical is a less-toxic version of car antifreeze. It is used in some pet food products and treats and is hidden in the ingredient list on the pack the under the terms “Contains EEC Permitted antioxidant, colorants or preservatives” . If you see this ask the manufacturer what preservative they are actually using. Propylene glycol is considered “safe” by some manufactures if used in small quantities. It is not only a very powerful chemical preservative but it has a strong artificial sweet taste that some pets find addictive. Encore refuses to use such ingredients and there is nothing artificial in Encore. Our products are kept fresh with more expensive natural citrus and herb extracts.